Risotto is one of our favourite dishes of rice cooked in stock with ingredients such as vegetables and meat or seafood. Making risotto has a certain technique which should be followed. You need to have some stock ready to cook the rice. Risotto is made in a pan and needs constant stirring for at least thirty minutes and adding the broth gradually, ladle by ladle, until it is absorbed. When the rice is cooked the final result should be creamy but not mashy. The rice should stay al dente. I have tried it in the past with a certain brand of arborio rice which I bought from a big supermarket but to be frank I did not like it. I am not saying that arborio is not good but maybe the specific brand I found was not the best, so next time I shall try another brand and see how it works. Until then, I prefer to use a brand we get in Greece called carolina, which is a white, short grain rice, very flavorful and it yields a stickier, softer result. It is especially good when a creamy texture is desired and this is the rice we use in Greece for dolmades, rice puddings, soups and risotto. Before going to the recipe, I want to thank you for leaving your lovely comments after our short get away. I have read all of them but need some time to reply and to visit you all. I hope to do this during the weekend. This year we decided not to visit any island but went by car to a lovely place not far from Athens, in the gulf of Corinth, called Saranti. It’s a small, picturesque village which you can see in the bay with a lovely beach, a few restaurants and cafeterias, no tourists, ideal to rest. We stayed in a small hotel, on the beach which is on the other side of the road. Today I had so many things to do, as tomorrow is a public holiday and all the shops will be closed, so we went to the farmers’ market, and then to the supermarket, so I decided to prepare something easy and quick. This time I made a few changes to my old recipe, and to begin with,I increased the amount of garlic, which stayed in the dish, as I am becoming a garlic lover. I bought some fresh mushrooms and bell peppers which, I wanted to use both. However, as two of my children do not eat mushrooms and peppers, I sauteed them separately with a few tablespoons of olive oil. When mixing in the shrimps I added some of this in the non stick frying pan and mixed them with the vegetables. This was definitely much better than the previous one as I love both mushrooms and peppers. Boil the shrimps for only 5 minutes, drain and reserve the broth. In a big skillet heat the olive oil and saute the onion on medium heat until translucent. Add the garlic and mix for a few seconds. Add the rice and stir until it is wet with the oil. Meantime, dissolve the saffron in the wine and pour in pan and cook for a few minutes, until the alcohol evaporates. Add the balsamic vinegar, tomatoes, salt, pepper and thyme and start pouring the broth, a ladle at a time until it is absorbed. Continue adding and mixing until the rice is cooked but still al dente. Five minutes before it is ready add the mushrooms and the bell peppers as well as the shrimps and stir. Add the cheese and mix. (You can skip this for a Lenten dish). Serve the risotto sprinkling some finely chopped parsley on top. I really shouldn’t be looking at food blogs when I’m hungry. This dish looks delicious. Sounds like a very lovely trip. Welcome back! Bring it on Ivy! I love this dish. It’s got all the things that are good for you..LOL. Garlic and shrimp are a real winning combination. Your risotto looks terrific! I love that big pan you use, too. I bet the balsamic vinegar provided a lovely tang to the dish. I totally hear you about cooking up the veggies separate for the kids. Mine are the same way. Great recipe! YUM! Ivy looks you had a lovely relaxing time away! 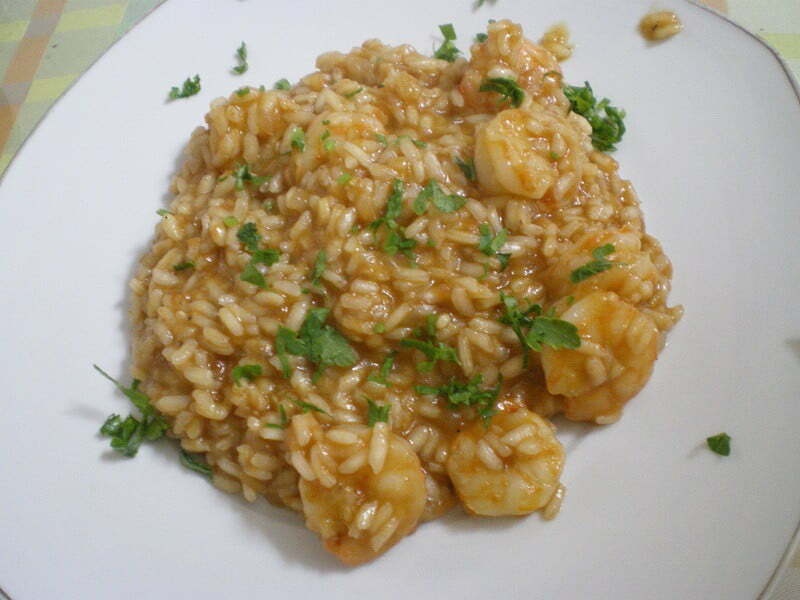 This Shrimp Risotto looks absolutely delish and something I would love. I can see why this recipe would be a family favourite Sis..I am so glad to be part of your adopted family:D The beach town looks very relaxing and the type of place I love to go where it is quiet and serene. Amazing shrimp risotto Ivy I love it. The flavours sound so tasty. Those darn kids! I would force them to eat peppers and shrooms. I love risotto! Looks wonderful. I have never got around to making risotto but have always wanted to. The ingredients in this recipe sound amazing, I would put mushrooms in for sure! ivy, looking at your photos, i miss bali with its tropical climate, where new zealand is now so cold. lovely to have shrimp risotto. i like risotto with spinach. A gorgoues looking risotto Ivy – it just says “summer” to me. Hmm! That looks delicious! Thanks for sharing the recipe though, man. Love lots from Bali.